​USC TROJANS, IT'S THAT TIME OF YEAR AGAIN! TIME TO SHINE YOUR BOOTS, DUST OFF YOUR KNEEPADS, AND COME TO FAIRHILLS FOR A DAY OF FUN CHUKKERS AND AMAZING FOOD WITH THE TROJAN FAMILY! THE BANQUET WILL TAKE PLACE ON SUNDAY, APRIL 22ND AT FAIRHILLS AND WE HOPE TO SEE YOU THERE! STAY TUNED FOR FURTHER INFORMATION ON SIGNING UP AND AS ALWAYS FIGHT ON! Due to weather, location and dates for the USPA 2018 Western Regionals may be subject to change, further updates to come! We look forward to seeing you all there rain or shine so stay tuned for the updated location and dates! Over Spring Break, members of USC POLO: Pavil Garg (21), Barrett Burnes ('20), and Marco Meier, will be representing USC POLO in local Argentine Polo Clubs. The men will spend their days riding, improving their polo skills, and playing chukkers on the sprawling grass fields in Argentina with the locals. The men are sure to have an amazing time FIGHTING ON in Argentina and will share their experience when they get back so stay tuned! 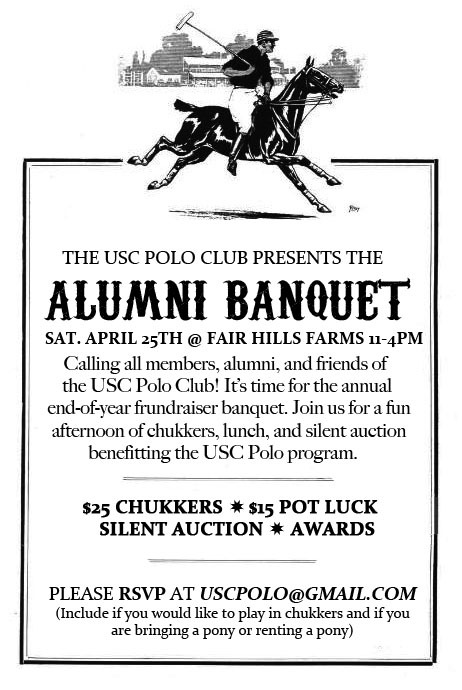 STAY TUNED ALUMNI AND POLO LOVERS FOR MORE NEWS ON THE POLO ALUMNI BANQUET COMING THIS SPRING IN APRIL! Be ready for a day of polo ponies, chukkers, and best of all, current and past Trojans! The date will be announced shortly, but the banquet will be held at Fairhills Farms in Topanga Canyon. Stay tuned for more information and as always, FIGHT ON! The month of April on the Trojan Polo Calendar has just been released! If you are a current member or a budding enthusiast who is excited to try out polo, go over to the JOIN POLO tab, scroll to the bottom and click SIGN UP on the bottom left corner. The link will direct you to the calendar where you can of course, sign up for lessons! We look forward to seeing you there at our practices and as always, FIGHT ON with USC POLO! ​usc women's team headEd to the USpa western intercollegiate regionals! The USC Women's Polo Team will be competing at The Western Intercollegiate Regionals on March 9-11 at the Central Coast Polo Club in San Luis Obispo! The team, coached by Ardeshir Radpour and captained by Ninon Cofrade ('19) with teammates Annie Choi ('21) and Makenzie Hajek ('20) have had an exciting season preparing for regionals with competitions against Stanford, UC Santa Barbara, University of Idaho, and Cal Poly San Luis Obispo. USC POLO is extremely excited for this weekend and invite you to come and FIGHT ON with the USC Women's Polo Team as they face off against University of Idaho on Friday, March 9, 2018. ​We hope to see you there and FIGHT ON! The team, coached by Ardeshir Radpour and captained by Ninon Cofrade ('19) with teammates Annie Choi ('21) and Makenzie Hajek ('20) has had an exciting season preparing for regionals with competitions against Stanford, UC Santa Barbara, University of Idaho, and Cal Poly San Luis Obispo. 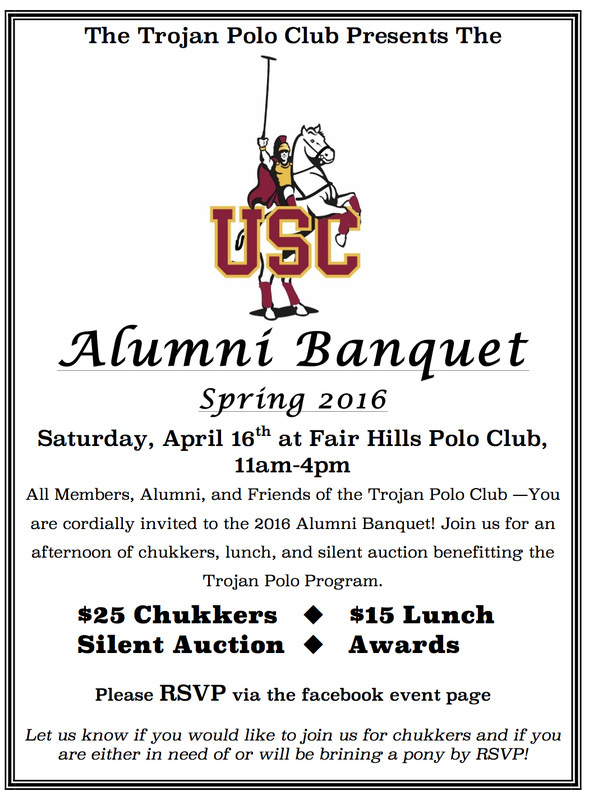 Join us for an afternoon of chukkers, lunch, and silent auction benefitting the Trojan Polo Program. Check out our flyer or our facebook event page for more information and don't forget to RSVP via our google form! We hope to see you there! Check out the USC Polo Club's updates with recaps of a great 2014-2015 academic year, and news of our upcoming endeavors! FIGHT ON! Hello and Thank you to the new faces I met at the USC 2015 Rec Fest. I will be sending out informational emails as well as updating the club website over the next couple days. Stay tuned. if you have any questions in the meanwhile please email uscpolo@gmail.com. Beginner Lesson Schedule Changes for the Month of March! Beginner Lessons for the month of March will be on Tuesdays and Fridays. Please email us back @ uscpolo@gmail.com if you are a recurring USC Polo student who is having any trouble making it to those lessons. We practice year-round four nights a week from 6:00-10:45 pm off campus at Fair Hills Farms (driving and tacking time included, but return time may vary depending on traffic). Club lessons are Tuesdays and Fridays. Team practices are Thursdays. We always arrange carpools. Check us out at the club fair each semester, or contact us at our gmail. Once you've introduced yourself (tell us your name, riding/polo experience, and height so we can pair you with an appropriate horse), you're welcome to sign up for lessons by clicking on "Lesson Sign Up" at the top of the page and adding your name to the calendar on the day you want to come. On the day of the lesson, you will get a group text telling you when and where to meet (usually the EVK parking lot), reminding you what to bring, and who will be driving that day. *Please note that we charge a $25 cancellation fee if you cancel the day of. Prior to your lesson, we ask that you fill out USC's club sports release form here. You will have to register with the website, join "Polo", and then fill out the release (if you're having trouble, an in-depth walkthrough can be found here). On the day of, be prepared for your first lesson with your lesson money/check and appropriate clothing. If you have an equestrian background and already own riding attire then please feel free to wear whatever you are most comfortable riding in. If this is your first time at a barn we recommend you wear jeans and a closed-toe shoe with a heel.